This post uses the self-programming function as an example to illustrate the working mechanism of the 10—22—27 formula. 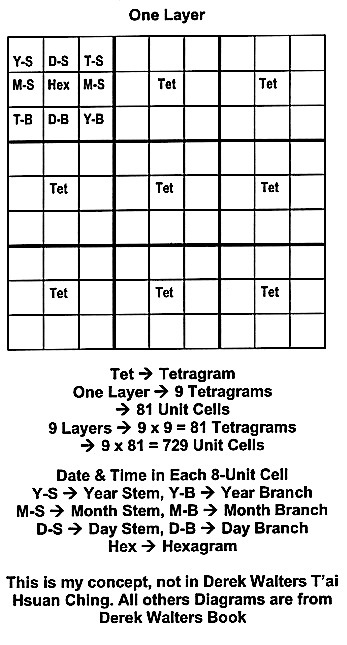 This is the 10—Stems—12—Branches—5-Element formula on describing Information—Energy executions inside the Vacuum Computer. Specifically, this posting will illustrate that the soul-mechanism is self-generating the Virtual “60 cycle Calendar” operating within the 10—22—27 formula. The diagrams within this Post specifically illustrate the Line Logic differences between the Tetragrams used in the T’ai Hsuan Ching and the Hexagrams generated by I-Ching logic. T’ai Hsuan Ching <——> [Soul—Self—Spirit] Holon Execution inside the Vacuum Computer, where the Observers are the Free Will Neutral-Lines inside the Tetragram Logic used by the Computer. Perverse Qi—Ch’I is contained inside the self-generated free will neutral lines embedded inside the Bigram, which in turn embedded inside the Tetragram. Notice, this Virtual Calendar is self-formed within God’s Holon, which is 9—-9—-9. I-Ching <——> [Soul—Observer—Spirit] is a Holon collapsed state that contains the vacuum computer’s output in a binary state where the human diviner generates the free will. Pre-Heaven Octagon <——> Observer is God, who in turn generated the Big Bang and Involution Line-Diagram Logic for the Universe. Post-Heaven Octagon <——> Observers are the Created Matter-Being Holon of [Celestial—Terrestrial—Living] Matter—Being Objects, while the Observed is the Free Will Neutral Lines inside the Mind Octagon; namely the Tetragram lines. This operation defines the act of divination. 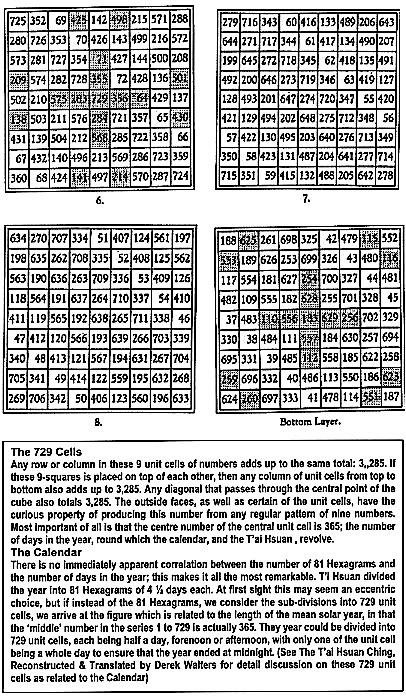 The Calendar, self-generated within the 729 unit cells, inside the Vacuum Computer mapped onto the physical calendar in space-time, which establish a correlation between the two. Dates and Time in each Layer. 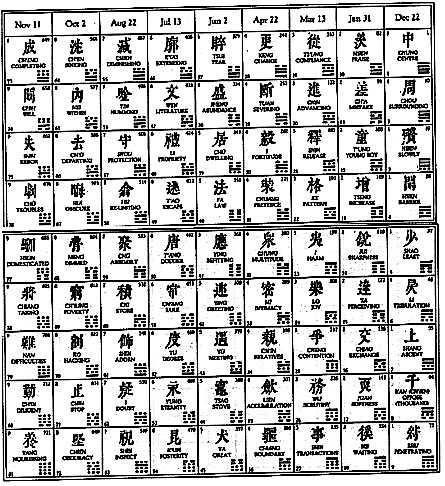 Remember, this self-generated calendar contains both perverse and beneficial “dates” without any external (input from the physical space). However, external interaction as observer—observed will bring in another perverse and beneficial, information-energy, set specifically applied to the observer. Remember also, these beneficial–perverse Non-Local—-Local Information are bio-quantum in nature and have only nano effects. Notice, there is no Body-Brain involvement in these computer execution. Notice, Humans can also intervene with their states of 靈-魂-魄, but this must be in a human state of ascension. 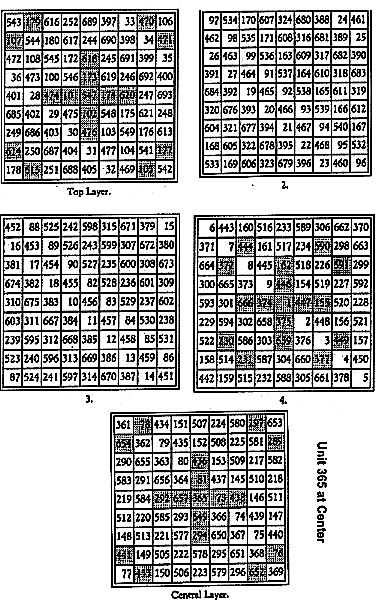 With the above soul-computer execution formula, as shown in the above two diagrams, soul-observations can now be explained. The Participatory Universe implies an Observer Participatory State that carries the following concept-definitions for descriptions of Soul-Computer Execution. Neutral Line <——> Free Will and the Photon’s Logic Component. 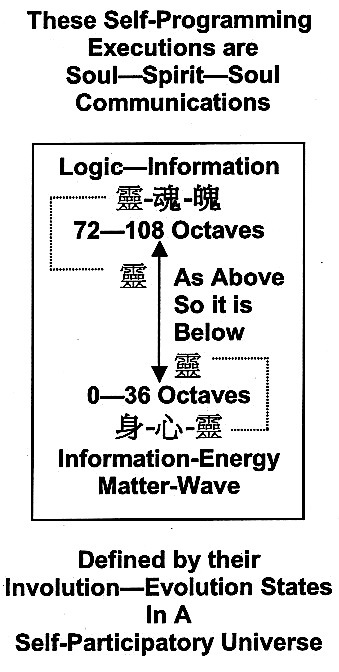 Thus, embedded in Logic-Information Crossover onto Information-Energy is Photon Interactions, which imply Light. The Participatory State is directly connected to the state of the Observer. The Observer state can be an active Brain-State or an inactive Brain-State. Active or Inactive is depended upon whether the observation is within or outside the Observer’s Reference Frame. Active or inactive is also dependent upon whether the observation is intended or unintended. The Observer’s participation is a function of the observer’s action operators. These operators are best explained with the nine Chinese Holon Characters the mapped onto the Holon of Brain—Soul—Spirit. The Observer’s Self-Participatory Operators are: (1) the Brain; namely with 神 (the spirit-mental state) in 精-氣-神, (2) the Spirit with 靈 in 靈-魂-魄 (the state of spirit in self), or (3) the Soul with 心 (the heart-mental state) in 身-心-靈. In addition, the embedded concepts of a body, in the Chinese characters, have the following mappings: 精-氣 —-> physico-chemical body, 身-心 (the acu-point circuits of Tw-HC, or the corresponding Heart-Brain Circuits) —-> soul body, and 魂-魄 (the seven chakra) —-> spirit body. With these Soul-Computer execution concepts stated above, we can know state the following generated computer-execution phenomena. The above bullets explain the journey of one’s soul according to the Matter-Being Paradigm. Finally, with this posting, the reader can now study the Lo Pan. The Lo Pan was originally a scientific instrument, used for astronomical observation, the purpose of which was twofold — firstly to keep the calendar in synchronization with the seasons, and secondly, as an instrument of divination.